Explanation: South of the large star-forming region known as the Orion Nebula, lies bright blue reflection nebula NGC 1999. At the edge of the Orion molecular cloud complex some 1,500 light-years distant, NGC 1999's illumination is provided by the embedded variable star V380 Orionis. That nebula is marked with a dark sideways T-shape near center in this cosmic vista that spans about 10 light-years. The dark shape was once assumed to be an obscuring dust cloud seen in silhouette against the bright reflection nebula. But recent infrared images indicate the shape is likely a hole blown through the nebula itself by energetic young stars. 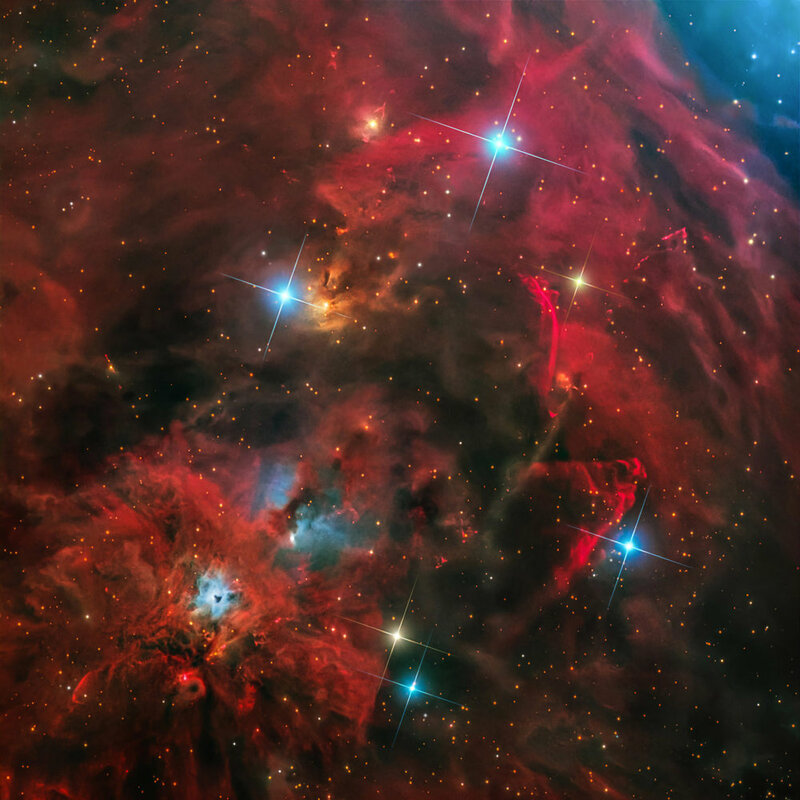 In fact, this region abounds with energetic young stars producing jets and outflows with luminous shock waves. Cataloged as Herbig-Haro (HH) objects, named for astronomers George Herbig and Guillermo Haro, the shocks look like red gashes in this scene that includes HH1 and HH2 just below NGC 1999. The stellar jets push through the surrounding material at speeds of hundreds of kilometers per second.